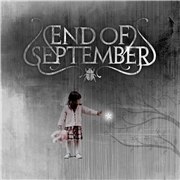 END OF SEPTEMBER started out in 2009. Formed by guitarist/vocalist Erik Tordsson, who´s got a past in both heavy and extreme metal, a demo was made with former vocalist Victoria Sundberg. A deal with Ulterium was secured, but Victoria left, and a 2 year hiatus commenced. In 2011 Elin Redin was attached to the line-up, now consisting of Erik, Victoria, and bass player Johan Nöjd and drummer Johan Svensson. END OF SEPTEMBER recently played Jönköping´s Zaragon Rock Club as support to AMARANTHE, which I missed. How good are they in the studio? As most female fronted bands they lean towards EVANESCENCE, and the sound has more than a modern touch. My player started with track four, “Exile”, for some reason, that wasn´t flattering for the band. The keys are a redeeming fact, but the guitar sound is oddly desert dry for three tracks. It´s strange concerning that the bandleader slash guitarist has been handling both mixing and mastering. “Exile”, “Inner Voice” and Left in This World” are not material to conquer the world, neither is the pleasant but anonymous “Autumn Breaks” or the very basic “A Place to Go”. On the plus side we have “Fallen”, that sounds like a different band at times, and the beauty and the beast duet “Waiting for the Rain”. The latter could really take the band places, if it wasn´t so alone. I must also mention “Silence” as an asset for the band. The refrain is substantial, there is pace and force, as well as the spirited keyboards. But as a whole, this is far too uneven.